← Improv Everywhere: Who Says You Can’t Have Cheap Fun in NYC? 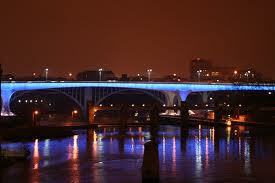 A night-time view of the new I-35W bridge in Minneapolis. Today marks the fourth anniversary of the collapse of the I-35W bridge in Minneapolis and a Remembrance Garden near the bridge will be dedicated this afternoon. Thirteen people were killed and 145 injured when the bridge fell into the Mississippi River on August 1, taking with it cars, trucks and the the public’s sense of security. It was an unbelievable scene and for weeks after, everyone in the Twin Cities told stories of someone they knew who was killed or who had just driven over the bridge before it fell in. Why those people? This entry was posted in Ideas for Book Clubs, Ideas for Book Clubs and Readers in General, Minneapolis/St. Paul and tagged books, Bridge of San Luis Rey, brother juniper, i-35W bridge collapse, I-35W bridge memorial, Minneapolis, Thornton Wilder. Bookmark the permalink.